Conditional Cash Transfers (CCTs) have been shown to increase investments in education and health, but their standard features make them expensive. Researchers conducted a randomized evaluation of a cash transfer program in Morocco to estimate the impact on attendance and enrollment of a “labeled cash transfer” (LCT): a small cash transfer made to parents of school-aged children in poor rural communities, not conditional on school attendance but explicitly labeled as an education support program. The program led to large gains in school participation; however, adding conditionality and giving cash transfers to mothers rather than fathers made almost no difference. Around the world, conditional cash transfer programs (CCTs) have been shown to influence households’ investment decisions regarding education and increase school attendance and educational attainment. One potential drawback of CCTs, however, is that two of their standard features, targeting—the process of defining and identifying eligible recipients—and conditionality—the requirement that recipients take certain actions, such as sending their children to school, in order to receive the transfer—make them expensive to administer. Moreover, targeting and conditionality can also lead to the exclusion of the poorest segments of the population: targeting systems have been shown to be imperfect, often excluding many poor households; and imposing conditionality means that those who cannot meet the requirements do not receive any benefit. While there is evidence that conditionality increases attendance, it is unclear how stringent the conditions must be. Can a cash transfer that encourages school enrollment without an explicit attendance requirement provide the small nudge necessary to increase educational achievements among disadvantaged communities? Morocco is a lower middle income country: its GDP per capita was about $3,000 in 2011. Education levels in the general population are relatively low and in 2012 only about 67 percent of the adult population was literate. While over 90 percent of rural children started primary school, the completion rate was still below 60 percent in rural areas in 2006. 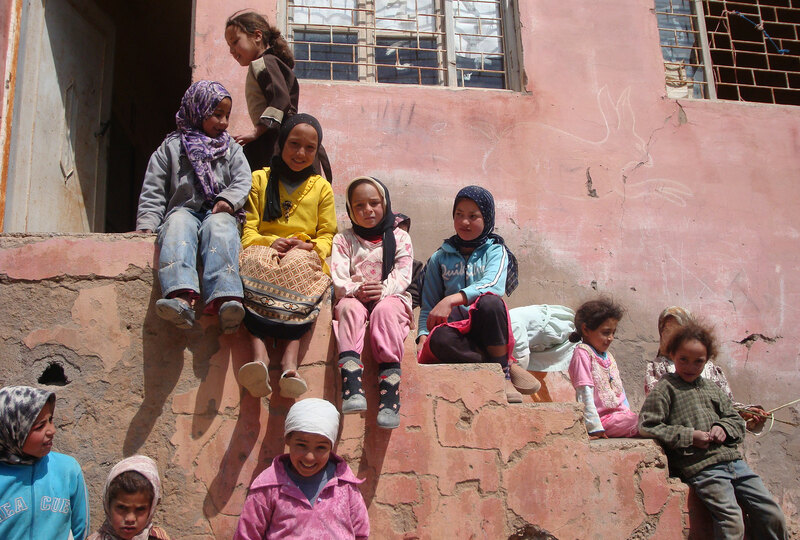 In order to address these issues, the Moroccan Higher Council of Education (CSE) together with the National Ministry of Education (MEN) launched a nation-wide cash transfer program to encourage parents to keep their children enrolled in school. Labeled cash transfer (LCT): In this version of the program, families with children of primary school age could receive transfers whether or not their children attended school. In practice, since enrollment in the Tayssir program happened at schools, children enrolled in Tayssir were automatically registered and enrolled in school at the same time, but the transfers were not conditional on continued enrollment. The monthly amount per child increased as each child progressed through school, starting from 60 MAD (US$8) for each child in grades 1 and 2 and increasing to 100 MAD (US$13) for children in grades 5 and 6. The average transfer amount represented about 5 percent of the average household’s monthly consumption, which is small compared to a range of 6 to 27 percent for existing CCTs in middle-income countries. Conditional cash transfer (CCT): In this version of the program, cash transfers were disbursed to parents of primary school-age children, as long as their child did not miss school more than four times each month. The monthly transfer amounts were the same as those in the LCT program. In order to determine if the effectiveness of the transfers depended on the gender of the parent who received the transfer (the child's mother or father), mothers—the recipients in almost all CCT programs to date—received the transfers in half of the school sectors sampled for Tayssir; while fathers received the transfers in the other half. LCT issued to fathers: This group included 80 communities from 40 school sectors. LCT issued to mothers: This group included 78 communities from 40 school sectors. CCT issued to fathers: This group included 176 communities from 90 school sectors. CCT issued to mothers: This group included 176 communities from 89 school sectors. Comparison group: This group of 117 communities from 59 school sectors received no transfers. Researchers collected information on student attendance and enrollment status for over 47,000 primary school aged children through unannounced visits to all schools. Comprehensive baseline and endline surveys gathered data on around 4,400 households. At endline, a basic test was administered to measure arithmetic performance of one child per household. Finally, awareness surveys were administered mid-course to measure teachers’ and parents' understanding of the program. Treatment and comparison groups were targeted geographically, which removed any ambiguity on eligibility and allowed for large program take-up. Around 97 percent of the study households in either the LCT or CCT communities had at least one child enrolled in the program. Compliance with the random assignment of the gender of the transfer recipient was very high: it was close to 89 percent on average in schools where mothers had been designated as recipients, and around 80 percent in schools where fathers had been. The Tayssir cash transfers greatly increased school participation under all versions of the program, with the LCT having slightly larger impacts. After two years, the dropout rate among students enrolled in school at the start of the program in LCT schools was about 7.6 percentage points lower than the dropout rate in comparison schools (at 10 percent), a 76 percent decrease. Re-enrollment of those who had dropped out of school before the program almost doubled in LCT schools as compared to comparison schools, and the share of students who never enrolled in school fell by 31 percent. Performance on a basic arithmetic test improved but not significantly. There was no difference in impacts between transfers issued to fathers and transfers issued to mothers. Making cash transfers conditional did not improve the effectiveness of the program either, but may actually have somewhat reduced it: relative to LCT schools, CCT schools had a slightly higher drop-out rate. Among students who were not enrolled at the start of the program, re-enrollment in CCT schools was lower than re-enrollment in LCT schools, perhaps because conditionality discouraged some households or teachers from enrolling weaker children in the program. The rules of the program were overall poorly understood by local communities. After one year, in the CCT groups, only about half of parents interviewed thought transfers were conditional; in the LCT groups, only about half of parents interviewed thought transfers were unconditional. A weak understanding of what households must do to qualify for the cash transfer may weaken the potential for conditionality to matter. Adding conditionality or directing the cash transfers to mothers did not increase the program’s impact on student attendance or school enrollment. This is likely because the Tayssir program was framed as an educational support program and perceived as an endorsement of the local schools, since headmasters were responsible for enrolling families. Data from the household surveys provides evidence that Tayssir, in all forms, increased parents’ belief that education was a worthwhile investment. Overall, the results of the Tayssir experiment suggest that in some contexts unconditional but labeled transfers targeted at poor communities can provide parents with the small nudge necessary to increase attendance. This nudge is relatively inexpensive, due to both small transfers per child and small administrative costs. In J-PAL's comparative cost-effectiveness analysis, both conditional and unconditional cash transfers led to 0.02 additional years of education per $100 spent. For more information, see the full comparative cost-effectiveness analysis. Benhassine, Najy, Florencia Devoto, Esther Duflo, Pascaline Dupas, and Victor Pouliquen. 2015. "Turning a Shove into a Nudge? A "Labeled Cash Transfer" for Education." American Economic Journal: Economic Policy, 7(3): 86-125.